The National Ski Patrol (NSP) has evolved over the years as snowsports development and ski area guest services have dictated. The NSP, a nonprofit organization founded in 1938, has now become an authority on outdoor emergency care by providing modern-day professional education, training, and credentialing to ski patrollers and other rescue personnel involved in the outdoor recreation industry. 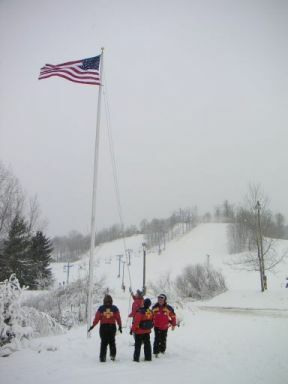 As newly developing snowsports such as snowboarding, snow-skating and tubing introduced new equipment and ever-challenging terrain parks to ski areas, new safety and emergency care methods and protocols were required of NSP to deal with these changes. Likewise, the growth of ski areas and their popularity inspired many traditional skiers to take to the backcountry beyond traditional ski area boundaries. This, too, meant that the members of the National Ski Patrol would have to develop new training regimens and extrication methods for servicing emergencies in these conditions. Thus, as the snowsports industry changes, so does the National Ski Patrol. Currently, there are 26,000 ski patrollers serving over 600 local ski patrols which make up the body of the National Ski Patrol. Ski patrollers can be any of various disciplines: alpine patroller, Nordic patroller, snowboard patroller, or even auxiliary patroller – one who administers first aid but does not ski, ride, or transport injured patients. Some patrollers are paid while most are strictly volunteers giving freely of their time. Ski patrollers provide emergency care, evaluation, and transport of injured or ill guests, and they also enforce local ski area protocols for the safety of everyone on the hill. Many members promote similar safety programs across the entire outdoor recreation community and educate neighboring ski patrols on the local, divisional, regional, and national level. While members of the National Ski Patrol come from all walks of life, many hold positions as medical professionals in their daily lives. NSP members work with local ski areas to maintain and improve the overall snowsports experience for the area’s guests. The National Ski Patrol has provided outdoor emergency care training and has established patrol associations in Australia, New Zealand, Israel, Canada, Korea, Turkey, Argentina, and Chile. Mountain bike patrols, whitewater rafting companies, search and rescue teams and similar organizations have adopted NSP safety training and education in their respective environments. Ski patrol training requires intensive study and hands-on training of emergency medical scenarios to gain experience with injured patients and the equipment necessary to treat them. Certification is given upon successful completion of all Outdoor Emergency Care course objectives. Alpine patrollers, snowboard patrollers, and Nordic patrollers must also demonstrate skiing proficiency and the ability to transport injured guests via toboggans in various snow conditions and types of terrain. The national office in Lakewood, Colorado handles administrative duties and derives financial support from membership dues, user fees, donations, and corporate sponsorships. In 1980, the National Ski Patrol received a federal charter from the U.S. Congress to continue to promote safety and health in skiing and other outdoor recreational activities. © 2019 Timber Ridge Ski Patrol All Rights Reserved.